Below is a listing of websites that Harmonic Mix has played a role in developing, publishing and hosting for organizations. Our goal is to provide you a website with content that you can manage. More information about Managed Content Sites can be found here. Site designed to inform the community on a local improvement project allowing updates to pictures, progress reports and notices. Visitors can register themselves for email notices about project progress. Google Analytics Integration as well as links to Facebook and Twitter accounts. Basic site that allows Breckenridge Homes to showcase current projects. Basic SEO, Google Analytics Integration, Admin Page for basic help and FAQ. Basic content management website providing Hampshire Park District the ability to maintain and add content, images and documents based on their needs. 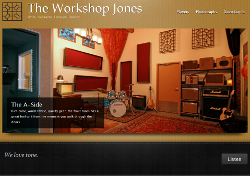 The web site provides an internet store front to clients for reserving space at a truly unique recording studio environment in the Chicago area. Features include basic SEO, Google Analytics, Shopping cart and reservation system, user registration and content management system based on Drupal. This site was designed to inform the community on a local improvement project. Project managers can update the site content, pictures and post progress reports and notices. Visitors can register themselves for email notices about site progress. Facebook and Twitter accounts were also integrated into this site along with Google Analytics for reporting. All of the sites below have been implemented using our custom content manager system. The Content Manager System was designed to be developer friendly for easy integration with custom templates and also easy for users to manage content. Used by a number of users to maintain and add content in various sections.